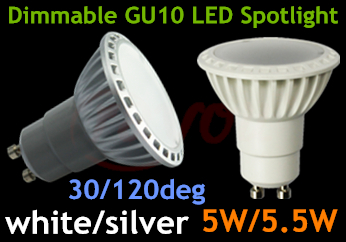 1.gu10 led spotlight is energy-efficient:Save 80% energy more than incandescent lamp. 2.Environmentally friendly:No any mercury and radiation like ultraviolet radiation and infrared light,ect. 3.Quick response,no strobe,no buzzing noise,instant soft start,and low heat. 5.5w led spotlight has 30deg or 120deg beam angle,and silver or white finished housing to choose. 6.More than 35000 hours lifespan for 110 volt led spotlight.